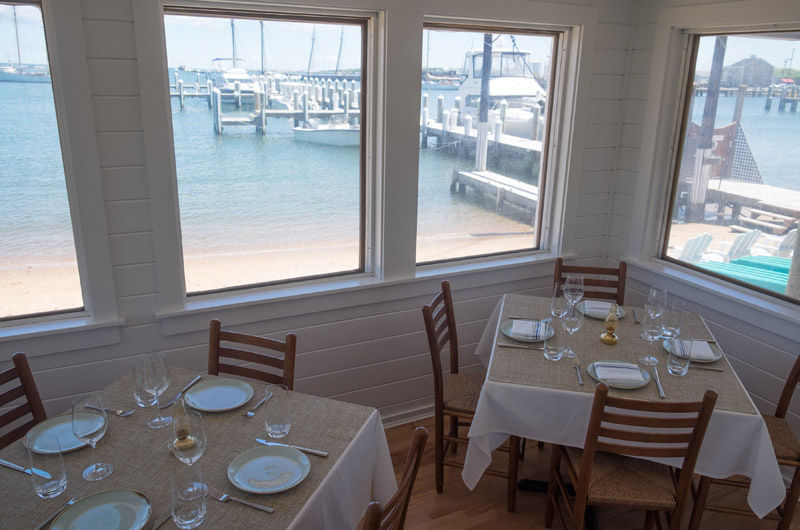 Tables with views at Garde East, located on the Vineyard Haven Harbor. A gentle murmur of conversation, the rattle of dishes floating in from the kitchen, the sunset painting the white walls a soft pink, it was a perfect setting for Vineyard Haven’s newest restaurant, Garde East, which celebrated a soft opening for friends and family early last week, and then opened for the public last weekend. Rubies of raw tuna served with duck skin cracklings and a fine bread crumb crust called “beach sand” stood out starkly against a white china plate. Soft pillows of wild ramps and goat cheese gnocchi were sprinkled with pine nuts, and loaves of warm nutty bread were delivered on wooden paddles with creamy butter sprinkled with a sea salt charcoal mix from MV Sea Salt. 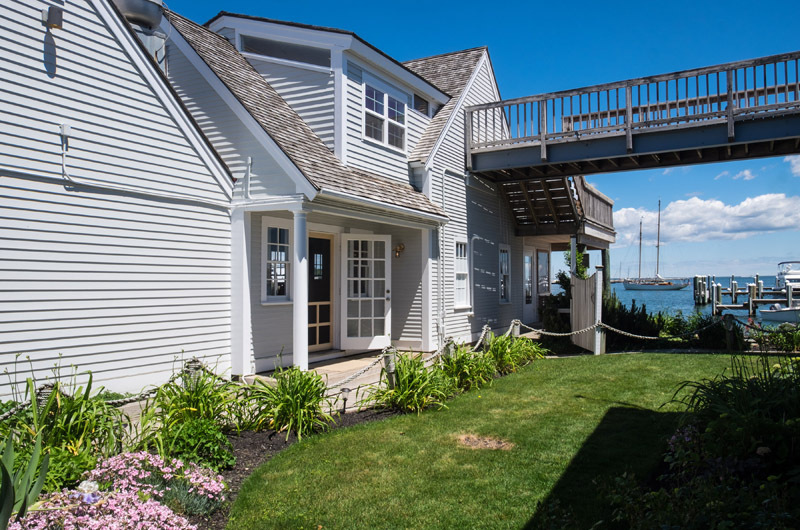 The upscale establishment located at 52 Beach Road on the Vineyard Haven harbor had arrived. The location formerly housed the Blue Canoe Restaurant, but this year the building’s owners decided to try their own hand in creating a new restaurant in the space. After all they do have a lot of experience. The father and sons team of Vince, Colin and Evan Geoffroy have been steadily building a restaurant empire in Rhode Island including Garde De Le Mer, Rooftop at the ProvidenceG and Gpub. 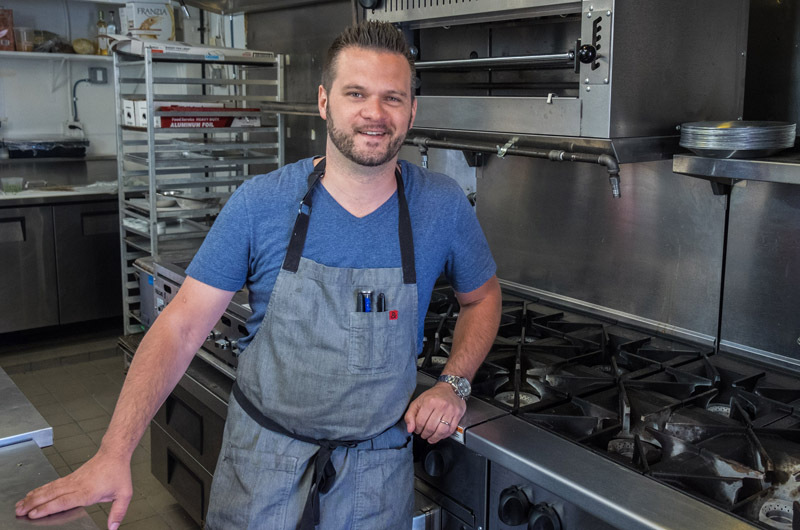 This winter they enlisted Robert Sisca as executive chef for their restaurants and to spearhead the new Martha’s Vineyard establishment. Mr. Sisca joined the G Hospitality team after 17 years in the industry, earning acclaim for his work as sous chef at Le Bernardin in New York and executive chef at Bistro du Midi in Boston. The 34-year-old chef has also cooked on the Island before as a guest chef at the Harbor View Hotel during Martha's Vineyard Food and Wine Fest in 2013. Mr. Sisca visited the space in April, when snow was still putting a damper on beleaguered spirits, and immediately saw potential in the picturesque location and the abundantly accessible seafood on the Vineyard. “Being out here, I mean look at this view, what fresher seafood can we get?” he said. After filling the small kitchen with state of the art cooking equipment, he began touring the Vineyard in search of ingredients. He found cheese and bone marrow at the Gray Barn, chicken at the Good Farm, rotating produce from Morning Glory Farm and Martha’s Vineyard Spearpoint oysters from Jeremy Scheffer. Mr. Sisca is constantly soliciting the freshest fish for the menu, which has a wide raw selection including a 14-element raw fluke. It is also what makes a chef an artist. Though his passion is focused on the kitchen, Mr. Sisca is just as distracted by the harbor views of Garde East as any of his visitors. On the first floor, a screened-in porch almost reaches the tide line, and the second floor has an open air deck for dining al fresca. Looking out at the open water further inspires his dedication to a fresh seafood menu. “My goal is to really utilize the bounty of Martha’s Vineyard, as much as I can get from local farms and local fishermen,” he said. There is always a catch of the day (this week is halibut) and menu items are always negotiable if a new fresh ingredient makes its way into the kitchen. In May, Mr. Sisca acquired an abundance of wild ramps, a short-seasoned leek with bright green, pungent leaves. He pickled the ramps to be used in the goat cheese gnocchi throughout the summer. Available to share (or for the monstrously hungry) are a 40-ounce steak and a whole chicken. The restaurant will operate seasonally from June to October. And although the restaurant looks the most magical at sunset, it will also be open for brunch on Saturdays and Sundays. Great location but you need better signage. I walk by it everyday and didn't know what it was or if it was open!